MANSFIELD, Mass. – It was a game that felt like a preview of the Div. 1 South tournament, with both teams defending in numbers and chances at a premium. 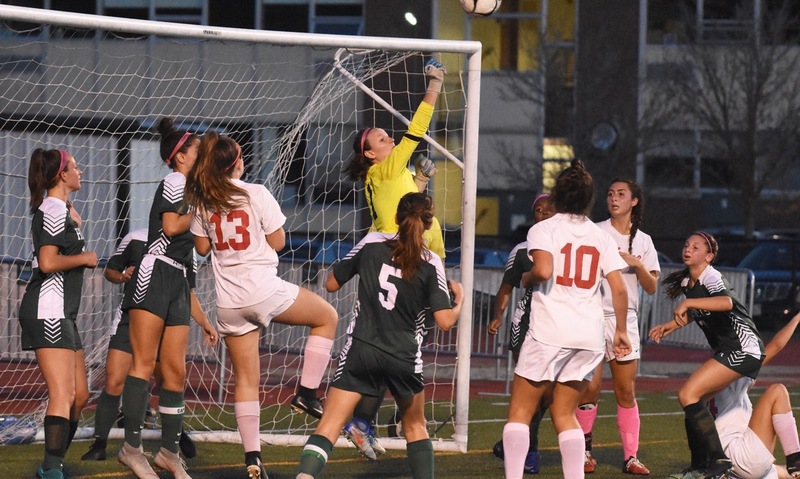 Mansfield and North Attleboro, both defending division champions, demonstrated tough team defense and got timely goalkeeping in a fast-paced, scoreless draw on Wednesday night at Alumni Field. North created early chances in the first half. Emma Gaulin was particularly active in the Rocketeeers midfield winning the ball back and pushing North into the attack. A give-and-go with her sister Ashlyn allowed her to run at Emily Vigeant but the Mansfield defender was able to get back in time. Just a minute later, Lydia Santos lined up a 30-yard free kick that dropped right into the middle of the box but was punched away by Mansfield keeper Lauren Whitman. The rebound fell to Haley Ferrin but her effort went over the bar. Kayla Pasquel played Emma Gaulin in behind on the left side of the box but her shot was saved by a diving Whitman (four saves). Mansfield also passed the ball well in the opening half and was finding some space behind the North fullbacks. Sydney Mulkern played a ball into Steph Kempon the left edge of the box and her cross bounced off a defender in the box and bounced to Katie Garvin, who hit the volley over the bar. Kemp had a neat turn in the box to get space for a shot that was blocked on its way to goal by Olivia Bishop. On the ensuing corner, Vigeant nearly curled it directly in, but North goalie Emma Noreck was able to get a fingertip on it. Emma Gaulin nearly opened the scoring a few minutes later but Whitman made the kick save. Just before halftime, Vigeant again came close from a set piece. This time it was a 50-yard free kick that she put just under the crossbar but Noreck was able to get up and tip it away. The second half was a much cagier 40 minutes, as both teams clamped down in the midfield. 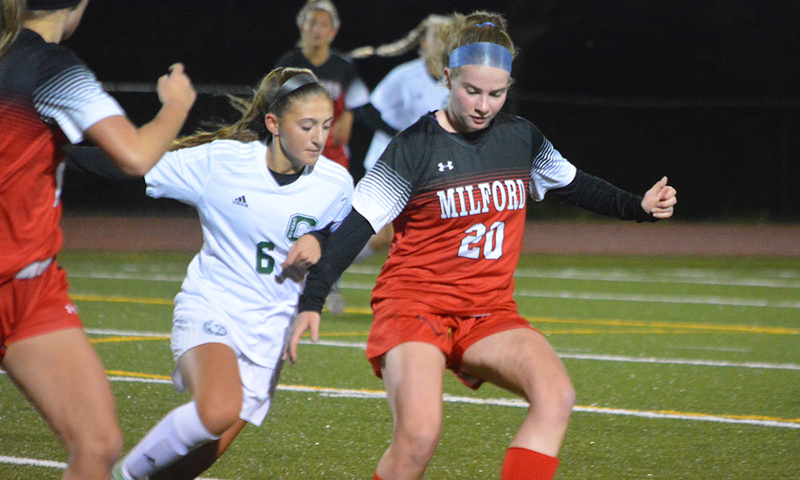 Melissa Reef helped out the Hornets back line in limiting the touches for Ashlyn Gaulin and the center back pairing of Mikaela Maughn and Vigeant kept just about everything in front of them. On the other side, Sam Hawkins, the only returning defensive player from last year, and Brieann Westcott were equally tough to beat. Mansfield had a good opportunity six minutes after the break when Garvin played Cassidy McMahon into space but Noreck was able to save. Vigeant’s corner found Garvin at the back post but her header was blocked by a host of North defenders. Alex Moulson had a chance off a North corner but her header went narrowly wide. Kemp reacted first to a loose ball and had a go from 20 yards, just missing the target at the near post. The best chance to break the deadlock came with 10 minutes to play. Santos slipped Pasquel into space on the right and she crossed to Ashlyn Gaulin in the box but the league’s leading scorer couldn’t get full purchase on her shot and it was saved comfortably by Mansfield’s second keeper, Caty DeMassi. North Attleboro (7-2-3, 6-2-3) will host Stoughton on Friday afternoon. Mansfield (9-0-2, 8-0-2) travels to Attleboro on Friday and then hosts Notre Dame Academy (Hingham) on Saturday.